It was my eldest son’s birthday on the 24th. We had a busy week before that and I couldn’t plan well in advance, like I usually do for his birthday cake. I didn’t have any fancy cake baking/decorating supplies too stocked up at home. Had to pull it off with what was readily available. Had some food coloring, sprinkles and colored sugar. 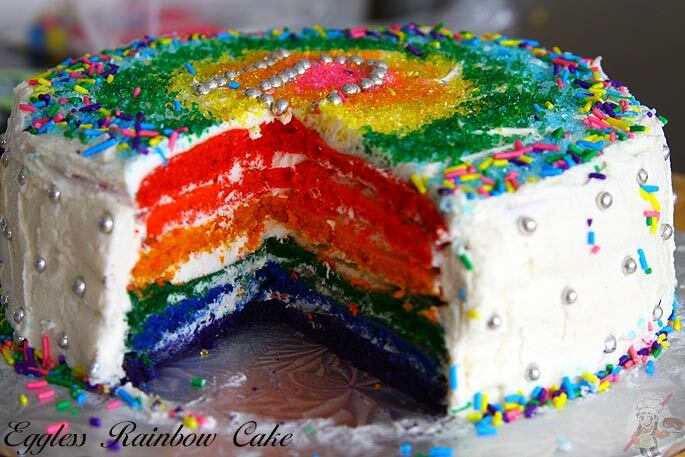 All I could come up with was a rainbow cake. I was also not having a party per se. It was just us, a family of 4 and 3 friends of his. So I didn’t want a big cake either. Decided to use my easy eggless cupcakes recipe as a base for this cake and proceeded. The layers were pretty thin. I was wondering how it will look at the end. But with the frosting between each layer, it did stack up like a normal size cake. It tasted all rich and buttery. Just missed to coat the layers with sugar syrup which resulted in a not so great texture. So please do not omit this step. Want to brighten up your little one’s special day? 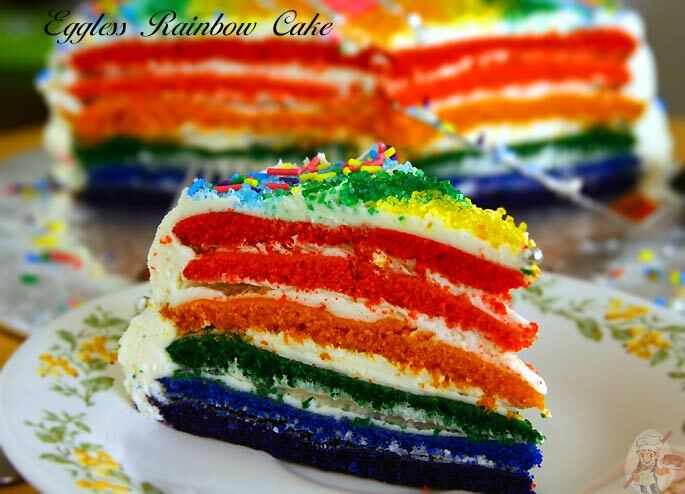 Then why not bake this egg free rainbow cake. It’s not as difficult as one might assume. Preheat the oven at 350F/180C for 15 minutes. Line two 8-inch round cake pan with parchment paper and set aside. If you have more pans, the better. In a large bowl stir together the dry ingredients and make a well. Add the wet ingredients into it, one after the other and mix well. Divide the batter into 6 equal parts. Approximately 1/2-3/4ths of a cup per bowl. Add one food color to each bowl and mix it well. Add as much as you want depending upon the color you desire. I used violet, blue, green, pink, orange and red. Since I had only 2 pans I had to bake 2 colors at a time, wait for it to cool down, remove it from the pan and repeat it for the next 2 colors. So 3 batches altogether. 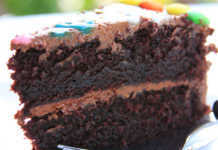 Bake for about 10-12 minutes each time or until a toothpick inserted in the middle of the cake comes out clean. Remove the pans from the oven and let it cool on a wire rack. Because I used parchment paper and because it was a very thin cake I was able to take it out the pan pretty quickly. Let the cake cool on the wire rack and repeat the same process for the rest of the batter too. Once all the cakes are baked and completely cooled start frosting the cake as usual; filling it with icing in between each layer and all over. I used the Vegan Buttercream Icing recipe, but used butter instead of shortening. 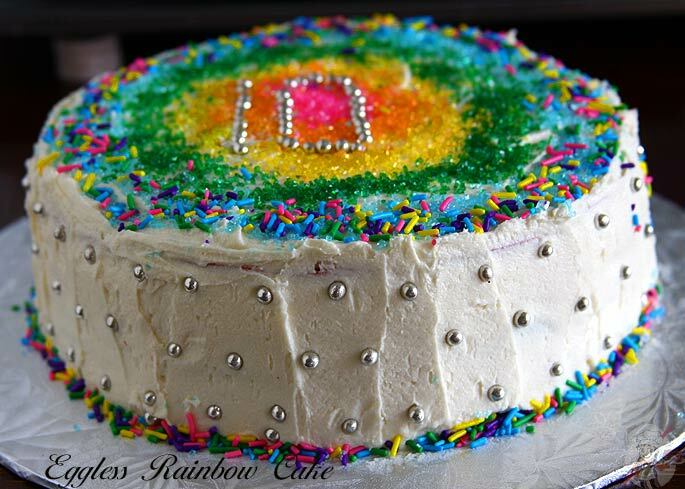 I also used some colored sugar, sprinkles and edible silver beads to decorate the cake. M&Ms would be a good option too. The one thing which I missed to do was coating each layer with sugar syrup before frosting the cake. I was on a time crunch couldn’t do it. 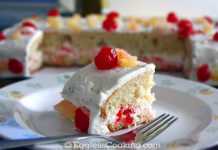 I wish I had done it because the cake was not as moist and soft as the Eggless Strawberry Cake. So don’t omit this step if you want a “store-bought” type of cake. The kids loved it nevertheless. This is quite a small recipe, ingredients measurement wise. So the layers came out pretty thin. But it’s enough if you are not making it for a crowd. Hey, i want to use your recipe to make a last minuyr birthday cake but i dont have apple cider vinegar now. Anything else i can use as replacement? If you have white vinegar you can use it. Even after using the vinegar this cake wasn’t light and fluffy like my other cakes because of the added food colors I guess. So I’m not sure how the texture will be affected if you omit it altogether. Thanks for the recipe, i have tried it but it turned out my cake was dense, muddy, with gluey structures. Not like in the picture, very airy and fluffy. Did you change anything else in the recipe? This is one of the cakes that I have baked a couple of times and haven’t had any issues at all. Can we use these measurements for 3 layers? Yes it will work but. 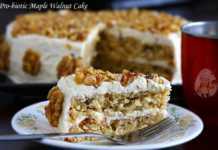 Can I use your vanilla cake recipe for this? It’s really not that difficult. Just prepare batter as usual and divide into portions and bake separately. The procedure is the same but just a bit lengthy.